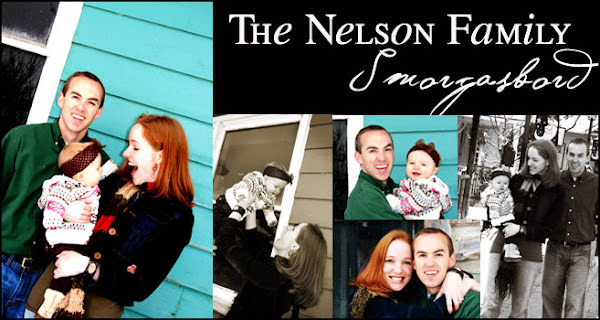 The Nelson Family Smorgasbord: "Jump On It!" 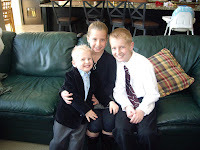 After only TWO dance lessons! 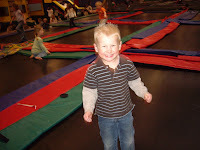 If anybody wants a FUN idea for an FHE activity or an ANY day activity, I discovered an awesome place in Lindon near Orem called, "Jump On It!". This past week we've been watching our awesome little cousins in Alpine and took them there for Family Home Evening and just had a blast! 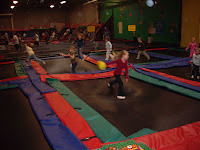 The entire gym is wall to wall trampolines, including vertical ones on the walls! There are basketball hoops to play a game of jump-ball as well as a "Kiddy-Jump" area just for kids. They even have a free Mommy/Baby jump time during the week! Your "ticket" lasts one hour and believe me, you are all "jumped out" by then! Give each member a STURDY sandwich size zip loc bag. 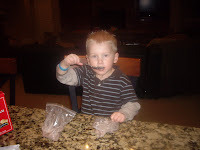 Put in the bag 1 cup whole, chocolate, or strawberry milk, 1 T. sugar and 1 tsp. vanilla. Seal bag. 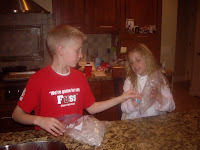 In a large one gallon zip lock bag, put 3-4 cups of ice and 6 T. Rock Salt. 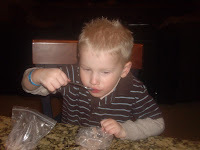 Add 1-2 of the smaller zip loc bags filled with ice cream ingredients. 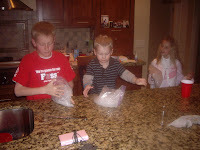 Seal the bigger bag and take turns shaking/kneading the bags and wait "patiently" for it to turn into ice cream. Enjoy! FYI- I am a faithful "Western Family" shopper, however for this particular recipe, you do need good sturdy "Zip Loc" bags, otherwise they break open and the salt leaks into the smaller bag. That looks like so much fun! I'll have to check out if there is something similar to that out here, it would be a great time! Ok. That very possibly could be the funniest dang thing I have ever seen with Jordan leading us all in the St Patty's Jig. I'm assuming he got new shoes, cause he had some "HIGH KICKS" going on. HILARIOUS! So glad that you are blogging now. I am going to start as soon as I get caught up with everything else in my life. Thanks for letting me be a part of the magnificent JIG with JORDAN and his "NEW SHOES"
You are going to be the funnest mom to all your little kiddies. That sounds like such a fune FHE activity! And that place in Orem, I have heard of it, but we've never been there. That Mother-Baby hour sounds like fun. Do you know when it is? We should get together and try it out!! !